Every year we take the munchkins trick or treating. We walk as a group and go house to house. We have never had a problem. But we have seen some kids wandering alone in the streets trick or treating on their own. The streets are dark after a certain time. Kids are easily distracted trying to get more candy, running from house to house, or having fun at the fun houses. But those without kiddos, go out to Halloween parties, clubs, or bars. Think about all the kids in the streets and start planning a safe and sober ride home from whatever fun you'll be having that night - so your evening doesn't turn into a real nightmare. Whether at a Halloween party, a costume contest at a bar or trick-or-treating through the neighborhood, many of us will be on the road this weekend. The National Highway Traffic Safety Administration and the Ad Council are reminding everyone that the best way to stay safe is to plan ahead and designate a sober driver before you head out for your Halloween festivities. 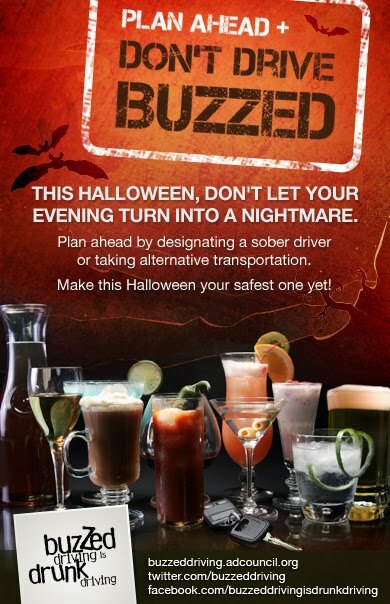 -Designated Driver Drink List -If you're throwing a Halloween party, make sure to offer non-alcoholic drinks for the sober drivers. Here is a Facebook tab with 50 non-alcoholic party drink recipes. Go to the Buzzed Driving is Drunk Driving website pledge not to drink and drive; play "Spot the Difference," an interactive game that simulates the effects of buzzed driving; and watch a real-life video about how buzzed driving changed one woman's life. Be safe. Have fun. Happy Halloween. Remember Buzzed Driving is Drunk Driving. So plan ahead and designate a sober driver before you begin celebrating. ***Disclosure-This post is my entry in a sweepstakes sponsored by Global Influencer.